Turkish President Recep Tayyip Erdogan has raised eyebrows around the world with a series of apparently outlandish comments but while his remarks sometimes cause bafflement abroad they strike a chord with many conservative Turks at home. In the last month alone he has declared that Muslims discovered the Americas before Columbus and that women are not equal to men. But these were just the latest headline-grabbing declarations from Erdogan over a long career of controversy. He rarely backtracks on a statement and in the two most recent cases has come out fighting, accusing Western media of distorting his remarks and insisting he was right in the first place. “Just because I repeated a fact based on scientific research, I have been targeted by the Western media, and the foreigners inside us, who suffer from an ego complex,” he said Thursday in response to the controversy over the Americas comments. But while the statements embarrass some inside Turkey and cause consternation abroad, analysts say they are aimed at impressing his core conservative support base that helped him win the August presidential election. “Most Turkish voters, given the level of their education, enjoy it when a Turkish leader locks horns with a foreign power,” said Adil Gur, head of the A&G polling group. But the frequency and intensity of Erdogan’s broadsides is now starting to cause concern even in places where he could normally count on fervent support. “He must think about speaking out less because, even if he is right, the way he talks gives rise to endless polemics,” said Mehmet Barlas, commentator for the pro-government Sabah newspaper. November 15, 2014: Erdogan says Muslim explorers made it to the New World before anyone else. November 24, 2014: Erdogan causes an outcry by saying women and men are not equal. November 3, 2014: On a visit to a district of Istanbul, Erdogan personally upbraids a member of the public for breaking the law on smoking in a public place. July 19, 2014: Erdogan launches a bitter attack against Israel amid its air campaign against Gaza. September 28, 2014: Erdogan ridicules the fuss over the new iPhone 6, saying it is the same as the last. “This brand brings out a new model pretty much every year. But in fact it (the iPhone 6) is not really different from last year’s version,” he said. March 20, 2014: Never a friend of new technology, Erdogan threatens to go a step further and eradicate Twitter. Hey PAKISTAN TODAY, are you anti Turkey or what?! 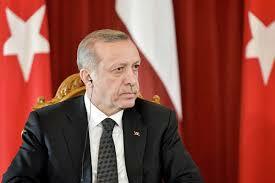 You must stop your baseless propaganda against Tayyib Erdogan. We Muslims love him. And by the way, all his statements should be taken in the right context. Kindly, stop being so irrational! Love and prayers for Turkey and Recep Tayyib Erdogan all the way from Ireland.